Wizzit Magazine makes a virtual photo tour around the world of great maritime disasters and explores the history of these sad casualties. Read the stories behind one man’s vision of the future and the sudden endings of those dreams, which in turn changed our world irrevocably. 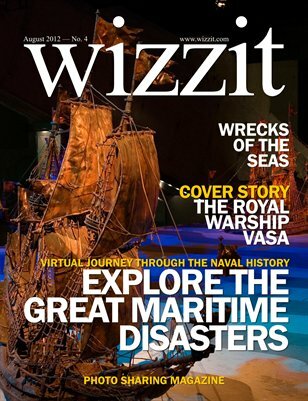 This Wizzit issue is dedicated to the great Swedish warship Vasa, which was built in early 17th century but sank during her maiden voyage only a few minutes after leaving the port. Vasa was salvaged 333 years later and put on display in the Vasa Museum in Stockholm. Dive into the fascinating world of shipwrecks and read the history of those unfortunate vessels.